U2 doesn’t walk on stage, they just appear. Somehow, even with the floor lights on and with the stages in plain view, Larry Mullen Jr. somehow managed to get to his kit undetected on the B stage just before the crowd of 40,000 heard the signature intro to “Sunday Bloody Sunday” While Mullen pounded away The Edge walked stealthily down a 50 foot ramp while playing the iconic riff. The protest anthems continued with “New Year’s Day” At the 60 minute mark, the crowd had heard four of their chart busting protest anthems including “Pride (In the Name Of Love)” before they got to the reason why they were here: to celebrate the 30th anniversary of their best-selling No. 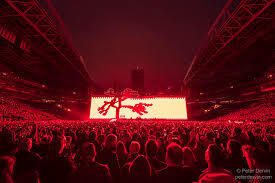 1 and arguably one of the best albums of all time, “The Joshua Tree” and perform it in its entirety and in order. That meant their perennial showstopper and historical highlight “Where The Streets Have No Name” batted in the lead-off spot. The album topped the charts in 20 countries It was performed in front of a 160 foot projection screen initially portraying a POV ride through roads and deserts and later used for projecting images of women of influence and immigrants. Still clearly the best number, the remainder of show retained the same energy with a throbbing version of “Bullet The Blue Sky” ” that was laced with a snippet of Led Zeppelin’s “Black Dog” and the first ever live performance of “Red Hill Mining Town” which Bono dubbed as “more relevant now than ever, especially in a place like Pennsylvania. The Edge’s signature Strat soared into a perfect rainbow that shrouded the stadium early on.